Manuscript Document from the Papers of General Capehart 3pp. 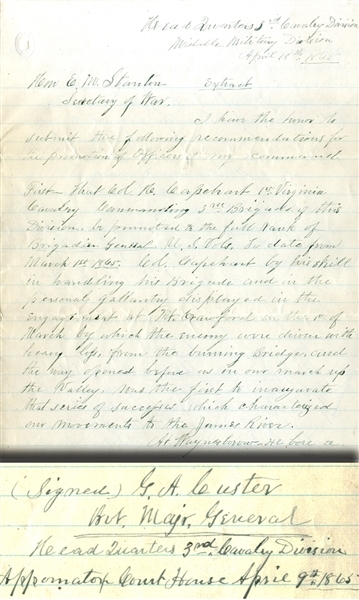 quarto, being a copy of correspondence, April 18, 1865, this letter was issued by General George A Custer to Secretary of War Stanton, pertaining to Capehart, it reads in part: “...Col. Capehart by his skill in handling his brigade and in the personal gallantry displayed in the engagement at Mt. Crawford on the 1st of March by which the enemy were driven with heavy loss, from the burning bridge, and the way opened before us in our march up the valley...In the late campaign from Petersburg to Appomattox C.H. Col. Capehart has been second to none in the display of marked ability , untiring zeal and energy, as well as unsurpased personal gallantry and daring...At Appomattox Station the 8th inst, Col. Capehart again rendered himself by his skill and bravery, and to him is much of the credit due, for the successful termination of that obstinate engagement which resulted in the capturing twenty foru pieces of artillery, besides a large number of prisoners, wagons &c. To say nothign of the influence which this engagement had upon deciding the fortunes of the following day...” More. Fine condition.